inaluxe is the melbourne based visual art duo consisting of Kristina Sostarko and Jason Odd. We have had the pleasure of working with them since 2009 and have watched their successes in working with clients from all over the world - IKEA, Earth Greatings, Kate Spade New York, just to name a few. Their work is inspired by the world around them, in particular from their home studio in the Grampian - the bush, bird life, mountains and native scenary. And is always colourful and bright! We look forward to working with them for many years to come. Unfortunately Museo Artist Cards are no longer being imported into Australia. Museo Artist Cards are double sided, include a printable envelope and come in four different sizes - small, large, square and panoramic. They are an amazingly good product and are quite beautiful. Very strongly recommended, there is nothing else like these on the market. Pre-scored, these cards are printable on both sides, each reproducing equally beautiful colour and quality on this newly designed 220 gsm stock. 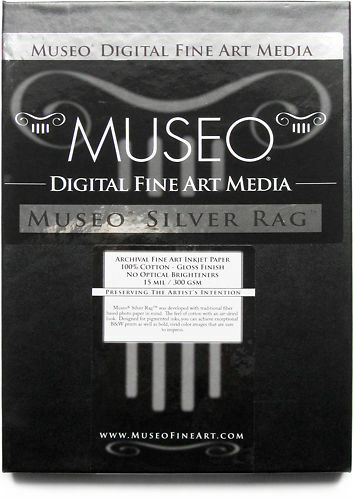 Museo Artist Cards are manufactured to the same high standards and archival characteristics as the existing range of Museo papers. 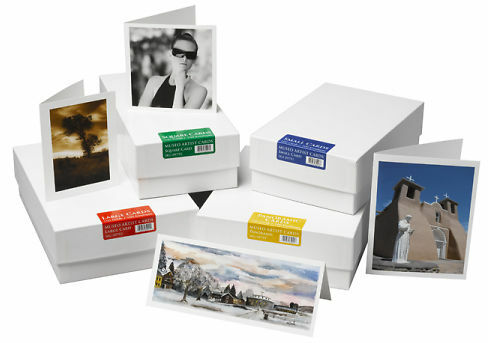 Museo Artist Cards are compatible with most photo realistic inkjet printers. Resin Coated papers are the modern approach. These use less fibre and replace the fibre with resin (a nice name for plastic). This means these papers are cheap, strong and robust, but tend to be less attractive to the touch and accept less ink. They tend to have a clinical appearance and it's hard to write on the back of them. They tend to be popular in the consumer and wedding/portrait markets. Fibre Based papers are traditional papers made without plastic, using only plant fibres. These tend to accept more ink and have a more attractive appearance, and these are the papers most of our customers favour. What is the paper base made from? In 'gsm' - grams per square metre. Not, technically, the same as paper thickness, but obviously correlated. The heft of the paper. European art papers are traditionally generally around the 300gsm mark. Asian papers historically tended to be lighter, 100 to 200 gsm. Papers with a higher GSM tend to have more opacity, i.e. you see less through them. What is the surface texture of the paper? We divide this into six groups. We go by the appearance of the actual paper and not what the manufacturer might label the box with! Double Sided - special case papers that are printable to full quality on both sides. What is the white tone of the paper? These days almost all papers are microporous coated - meaning they'll accept inks from both dye based and pigment printers well. In years past, some papers had a swellable coating - designed to give a greater life to prints with dye based inks but this approach has fallen out of favour. What ink type (dye and/or pigments) can you use with the paper? Also, if using pigment inks and you have a choice, should you use the Matte Black or Photo Black ink? Does the paper contain chemicals in it to brighten its appearance? Crystal clear bags for cards in small, square and large sizes. 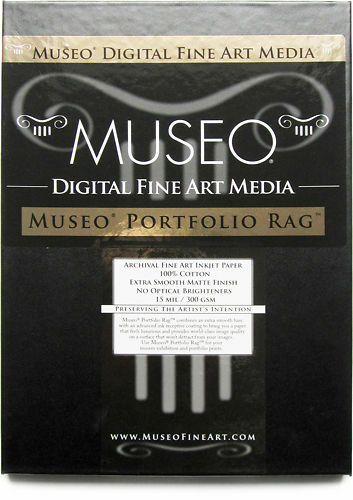 Hand curated articles, links and downloads to help you get the best from your Museo Artist Cards 220gsm. A summary of the different inkjet paper surface types. An explanation of the main types of base materials used in Inkjet Papers. How to determine the printable side of Inkjet paper. The difference between Fibre Based (FB) and Resin Coated (RC) papers. What Should I Call My Prints? Notes on the different names for inkjet prints and what is the best term to use. This is our favourite paper of all time! Gorgeous matte rag surface and the best blacks in the business! ​A great semi-gloss option for inkjet printing!